During August I read Hilary Spurling’s biography of Matisse, Matisse: The Life, (Penguin Books 2009, the cut down version not the two volume job). It’s taken time to work through it because alongside it I’ve had open my catalogue from the 1995 Matisse exhibition that toured Australia, so I could see more of the works that Spurling covers in her book. The day I finished reading the book I went to the NGA and drew various elements from Oceania, the Sea. 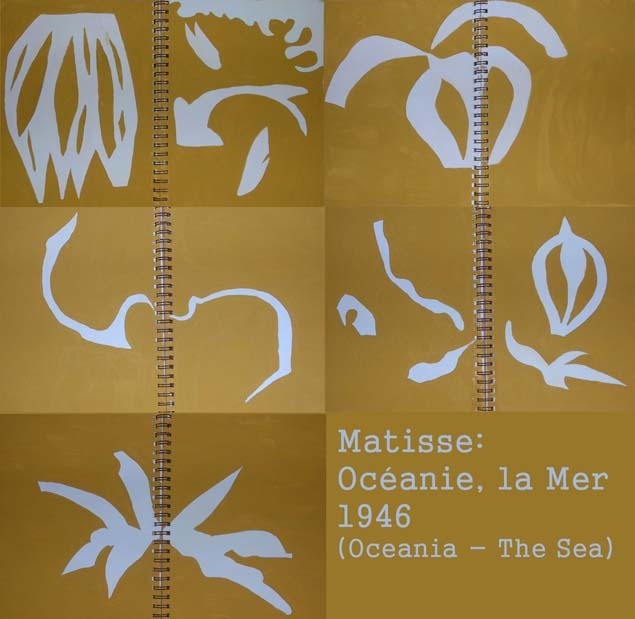 This work was inspired by Matisse’s visit to Tahiti in 1930, but remained unrealised until 1946 when he made the work as a paper cut out, which was subsequently printed on linen in 1948. As I got rather carried away by drawing various elements of this work, (13 pages of drawings of which12 are double pages), subsequently painted in gouache, I’ve made some composite images of my efforts. “experimented with focus, depth and angle, staring down from above into the green floor of the lagoon, looking up from below at a watery ceiling opaque and wavery as medieval glass, plunging repeatedly between the two, schooling the retina to compare the different luminosities of sky and sea.“( p 401). The National Gallery of Australia also owns the companion piece, Oceania, the Sky. The NGA’s curator Lucinda Ward takes up the story. 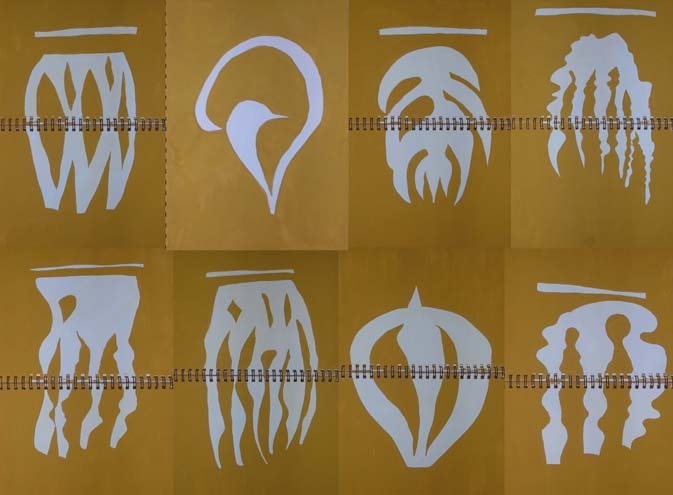 I found a resonnance between the Matisse cut-outs and Kelly’s shadow drawings. Simplified forms, set against a plain background. I also found a similar response in the work of Branda Kesi’s Siechoutie – muddy bark, 2009, a stitched and painted bark cloth, that I also recorded on the same day. “While riding the bus, I noticed that the shadows of the window frames falling across my book changed as the bus moved. With my use of drawing by chance I quickly marked many pages with outlines of the changing shadows. Later in my studio I inked in the drawings in the sketchbook, several of which I developed into paintings.” (Ellsworth Kelly writing about his sketchbook 23, 1954, (Drawings on a Bus), 9 October 2006). The theme ‘shadows’ and this passage in particular, was used as starting points for the latest design excercise for the textile group I belong to. From our subsequent discussion it was clear that we all discovered that drawing shadows was a more complex process than Kelly’s work implied. We all tried the obvious, putting a sheet of paper down and tracing the shadow thrown on the page. We observed that shadows weren’t always uniformly dark, or uniform in strength, or one colour (gosh those Impressionists were right after all). Often they didn’t stay still for long. 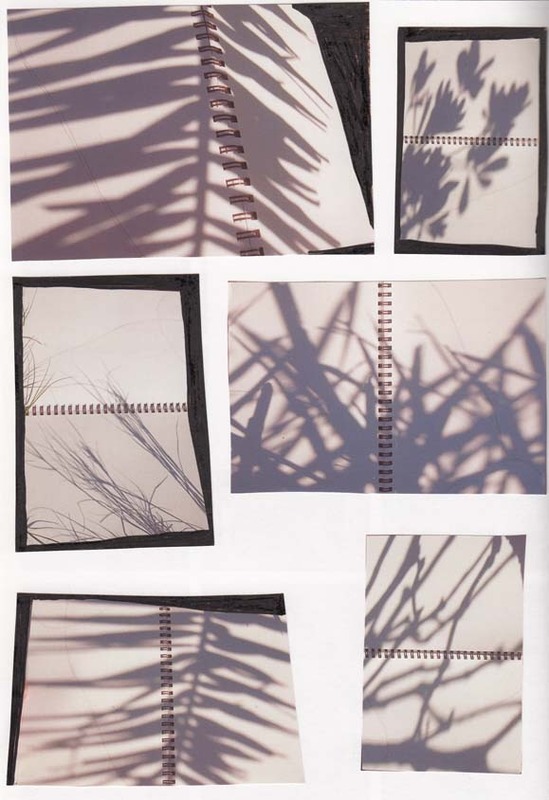 After a frustrating time down the coast trying to trace shadows in the face of a stiff sea breeze I found that photogrphing the shadows falling on the page was far more effective. In the end the strength of Kelly’s work really spoke to me so I made a very literal translation of a number of his drawings with ink onto three pieces of cotton, placed on top of each other. The fabric was cut to the same height as his book (which is obtainable in facsimile), although I left the full length of the fabric as it came. I wanted to take this a bit further, so I cut some of the top layer of the fabric and wove it into a small tapestry. I had hoped that the ink ‘shadows’ might make patterns that were more obviously related to the original drawings, but it wasn’t the case. I subsequently tried weaving one of Kelly’s drawings into the tapestry. I then re-inked what I had left of the fabric, over the original drawing. Kelly’s images still remain strong. This idea is still very unresolved for me. I have two more pieces of fabric to play with. image from the facsimile edition of one of Ellsworth Kelly’s Drawings on a Bus, 1954.